Phew! Here is the powerful, eye opening presentation recently made in April 2018 by leading UK cardiologist Aseem Malhotra. The title of the presentation speaks for itself, and it covers a number of important topical issues in healthcare, exposing conflicts of interest amongst leading health advisors, the misleading use of statistics, and the damage that sugar, refined carbohydrates and ultra processed ‘foods’ are doing to our health. 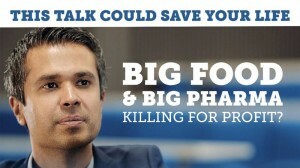 Most importantly, it emphasises that in Aseem’s experience ‘ lifestyle changes are more powerful than any drug at both treating and preventing heart disease,’ and many similar conditions such as obesity, type 2 diabetes, and other conditions that are ultimately driven by chronically high levels of insulin in your body – which in turn are largely driven by what we eat and drink. At 7:50 note Aseems’ comments on rampant misinformation within medicine as a result of biased funding of research, biased reporting in medical journals, biased patient pamphlets, biased reporting in the media, commercial conflicts of interest, defensive medicine, and medical curricula that fail to teach doctors how to comprehend and communicate health statistics, and the damage that this does to patients and the quality of care they receive. At 15:00, note the explanation of the differences between relative risk versus absolute risk (or the number of people needed to treated for one person to gain a benefit), and how these differences are manipulated to try to ‘sell’ a benefit where none (or very little) really exists. As an example of this , in high risk type 2 diabetics primary prevention with atorvastatin 10mg RRR 48% in stroke over 4 years. Sounds impressive, but NNT in this high risk group is 77…ie 77 people need to take it every day for four years for one extra stroke to be prevented…and this is in a high risk group! And mismatched framing in journals at 16:00…Aseem comments that this is not science, its marketing! Note the statin case study at 18:00, and the controversies surrounding the wider issue of over use of statin medications. Note the little reminder at 26:30 of how the UK Government was ‘persuaded’ to waste £500 million pounds on a useless Tamiflu vaccine during the Swine Flu ‘scare’ a few years ago by a drug company whose raw research data was later shown by independent researchers to show that the vaccine was no better than using paracetamol to manage the symptoms of the flu. At 27:00, note the comment about the financial ties between drug companies and members of panels responsible for recommending medicines or medical devices to government bodies. At 28:00, note the story of the 2016 Sunday Times article. At 30:00 and onwards, note the scary story of research misconduct, ‘me too’ drugs that offer the illusion of innovation (which just happens to extend the ability to charge more for ‘new’ drugs that are ‘better’ than the old ones and of course are patent protected for a further several years), the fact that drug companies spend twice as much money on advertising and promotion as they do on research, and the comments at 36:30 of Dr Marcia Angell, the former editor of the New England Journal of Medicine, that it is no longer possible to trust much of the published research tor the opinions of trusted physicians or authoritative medical guidelines. At 38:00 on the obesity epidemic, note that the UK is now considered the ‘Fat Man’ of Europe…2/3 of adults are overweight or obese, and sadly by the time they leave primary school 1/3 of our children are as well. At 39:00, note the unavoidable exposure to processed foods that are highly obesogenic, and the reality that knowledge is not enough when the food environment is constantly working against you. At 43:00, note the comments on the power of lifestyle interventions, and the importance of legislative change and leadership – be it on sugar, tobacco, seat belts, alcohol or other issues. At 45:00, note the fascinating back story on the politics of the sugar/fat debate, the story of sugar and fat, the discrediting of Dr John Yudkin and the promotion of the work of Ancel Keys, and the damage sugar/refined carbohydrates are now doing in terms of obesity, diabetes, heart disease and so much more. At 47:40 note Aseems comments on how they get taught nothing about nutrition at medical school. At 48:00 note the explanation on how sugar promotes insulin resistance, that ultimately leads to all kinds of metabolic and health issues. At 52:50, note the comments about the food industry’s corporate playbook on how to respond to the criticisms of excess sugar in food, and note how it is very similar to the strategies adopted by Big Tobacco on the issue of the dangers of cigarette smoking. At 57:30, note the comments on how the empire struck back when challenged on sugar, and Andrew Lanley’s (a former UK Secretary of State for Health) compromised involvement in trying to undermine Action On Sugar campaign. Check out Malhotra’s great book ‘The Pioppi Diet’ – it’s a fantastic book (with an unfortunate title because it’s all about lifestyle changes and definitely not a ‘diet’ book), and note his comments at 1:05:30 that ‘ lifestyle changes are more powerful than any drug at both treating and preventing heart disease, and they come without any side effects, so this is what should really be at the forefront clinical care right now to deal with the ever increasing burden of chronic disease”. Note his comments that coronary artery disease is a chronic inflammatory condition the risk of which can be rapidly reduced by simple lifestyle interventions, especially the ‘high fat’ Mediterranean diet – basically a diet based on lots of oily fish, nuts, olive oil and non starchy vegetables and low in refined carbohydrates and sugar. If you do this in conjunction with walking everyday for 30 minutes, manage stress and get decent sleep you can really reduce your chances of developing these conditions. At 1:06:40 note the comments on insulin resistance, which is really at the heart of all of this – it is a precursor for Type 2 diabetes, it is the number 1 risk factor for heart attacks, and about 50% of patients who have high blood pressure is rooted in insulin resistance (insulin promotes the reuptake of Na in the kidneys!). For great information on all of this have a look at diabetes.co.uk and their dietary guidelines…consider a low carb approach if it seems right for you. Get advice on this if you are type 2 diabetic or have a diagnosed illness of any kind. At 1:09:00 note the NNT quiz…look at the NNT of 30 for the Mediterranean diet!! So, there you go…we hope you find the information this presentation provides helpful in taking good care of your health, and that of your family!